Your home is your castle. It is important to create a look and feel for your home that matches your own unique personal style. 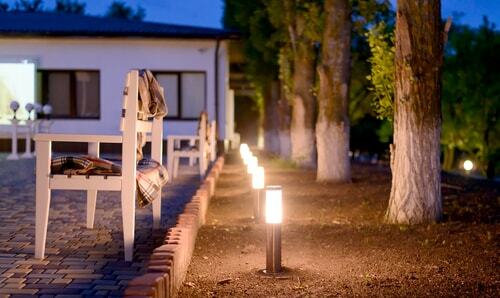 Landscape lighting can be a great way to bring an elegant and fresh look to your home. This curb appeal can also add to the value of your property. At Mr. Sunshine’s Home Services, we will be able to help you create an amazing look with some of these landscape lighting ideas. The great thing about solar-powered lights is the lack of annoying wires that may clutter your walkways. There are many different options when it comes to the styles of solar-powered lights you can use to decorate your walkways. Solar-powered lights will also make your walkways much safer for your guests and family members during the dark hours of the night. Christmas lights don’t have to be used just during the winter months. You can find classy ways to decorate your gutters, trees, and bushes year-round with Christmas lights. Our professionals can help you design a subtle yet exciting look with Christmas lights that can last all year. Lighting your stairs is a quick and easy way to make the exterior of your home look more elegant while also adding to the safety of your property. If you don’t want to completely redesign your stairs, there are smaller accent lights that can be added to stairs. However, deck stairs are fairly easy to redesign. Our Goodyear electricians have helped many homeowners build or redesign their deck stairs to create a look that focuses on elegance, luxury, and safety. If you are like many homeowners, you may spend countless hours in the garden trying to find that look that is just right. What is the point of only showcasing your garden that you worked so hard for during the day? With the use of landscape lighting, you can show off your amazing green thumb around the clock. Seasonal lighting can be a great way to add to the value of your property, show off your personal style, and have a more inviting home. If you feel like it is time to upgrade your home’s exterior lighting, give one of our experienced professionals a call today. We can help you create an outdoor look that you will be impressed with for years to come.